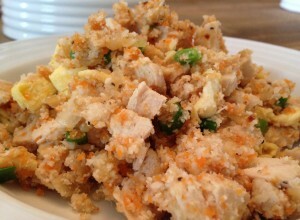 Chicken Fried Cauliflower Rice | Whole Food. Real Food. Good Food. 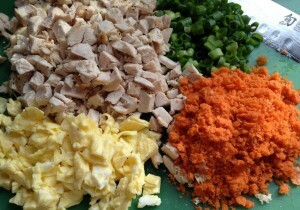 One of my son’s favorite Chinese take-out dishes is chicken fried rice, so I set out to make him a grain-free version. 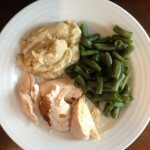 He gobbled it up last night, which was very exciting for me because this dish is so healthy! I used cauliflower in place of rice, which is one of the main reasons this dish is so good for you. Cauliflower is a cruciferous vegetable — one of the big reasons to eat plenty of cruciferous vegetables is that they may help to lower your risk of getting cancer. Cruciferous vegetables have compounds called glucosinolates. Non-cruciferous vegetables do not not have glucosinolates. These compounds KILL carcinogens before they can damage our DNA and prevent healthy cells from turning into cancerous cells. They provide vitamin A, B6, C, K, folic acid, potassium, maganese and iron. Some other cruciferous vegetables are kale, bok choy, broccoli and brussel sprouts. I use coconut aminos in place of soy sauce. When the coconut tree is tapped it produces a highly nutrient-rich “sap” that exudes from the coconut blossoms. This sap is raw, very low glycemic, an abundant source of 17 amino acids, minerals, vitamins, and has a nearly neutral pH. A comparison between coconut tree sap and soy, shows that coconut sap contains 2-14 times the amino acid content of soy. The most notable nutritional benefit is the amino acid content compared to soy-based sauces — commonly described as the building blocks of protein. No table salt or preservatives are added to coconut aminos. Further, soy sauce contains sodium benzoate and soybeans — 91 percent of soy crops are genetically modified. You can use coconut aminos as an alternative for soy sauce, marinades, sautés, and with sushi. It does not have a coconut flavor. When preparing this dish, the best piece of advice I have is to have everything chopped and ready to add before you actually start cooking, as this cooks very quickly and leaves no time in between. You will notice, my carrots are very fine and that is because it is the leftover pulp from my juice. I have been trying to find more ways to incorporate the pulp of our juices into foods because I always felt so wasteful throwing it away. If you do not have a juicer, no worries — you can add chopped cooked carrots or not use them at all. Peas would also be a good addition to this dish. If you prefer a less spicy dish, cut down on the pepper using 1/2 teaspoon instead of the 1 teaspoon the recipe calls for. My husband loves a spicy dish, so he added Sriracha Hot Chili Sauce to his. Coat chicken breasts with olive oil or avocado oil, sprinkle with salt and pepper. 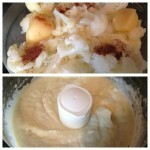 Cut cauliflower into florets and place in your food processor. Pulse until cauliflower is reduced to the size of rice. Set aside. In a small bowl, beat egg with water. Melt ghee in a large skillet over medium low heat. Add egg and leave flat for 1 to 2 minutes. 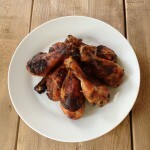 Remove from skillet and chop. Heat oil in same skillet; add onion and saute until soft. Add garlic and ginger, sauté for one more minute. Add cauliflower rice, coconut aminos, green onion, carrots, pepper and chicken. Stir fry together for about 5 minutes, then stir in egg. Serve hot. Purchase all organic ingredients if possible. 1. 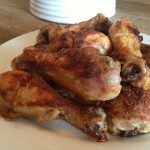 Coat chicken breasts with olive oil or avocado oil, sprinkle with salt and pepper. 2. Bake at 350 degrees for 45 minutes. 3. 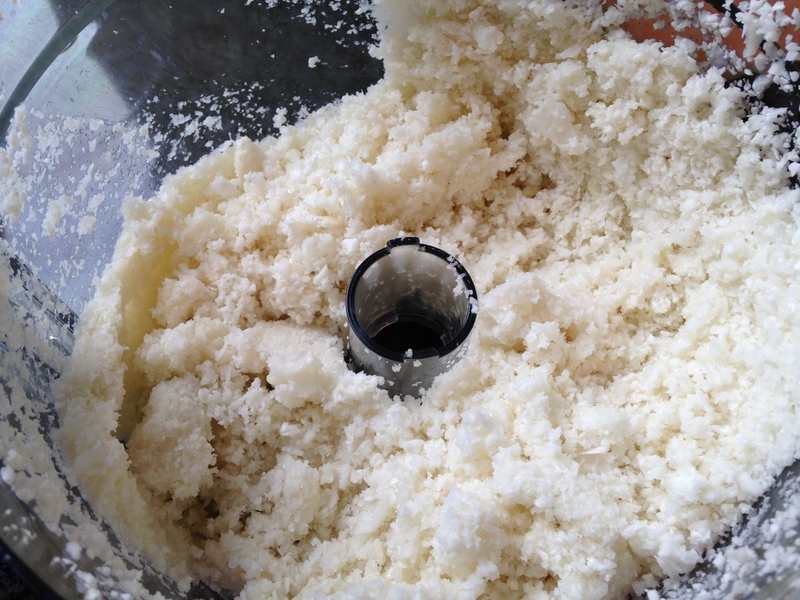 Cut cauliflower into florets and place in your food processor. 4. Pulse until cauliflower is reduced to the size of rice. Set aside. 5. In a small bowl, beat egg with water. 6. Melt ghee in a large skillet over medium low heat. 7. Add egg and leave flat for 1 to 2 minutes. Remove from skillet and chop. 8. Heat oil in same skillet; add onion and saute until soft. 9. Add garlic and ginger, sauté for one more minute. 10. Add cauliflower rice, coconut aminos, green onion, carrots, pepper and chicken. Stir fry together for about 5 minutes, then stir in egg. Serve hot.